You can easily manage these cupcakes from start to finish in just a couple of hours (if that!) and with a yield of two dozen they'll feed a crowd. I made some curvy chocolate shards using melted chocolate chips and a piece of parchment paper for extra pizazz. I think they look cute and they're so easy to make. You can see exactly how they are made in the video tutorial below. Do we really need an occasion to make these? Naaaah. But I think they would be great for an office party or a special birthday. My favorite part of the recipe is the coffee soak. It is so rich and flavorful. The creamy mascarpone frosting does a good job of adding lightness and it balances the espresso flavor well. This is a must-try for any coffee (or tiramisu) lover! In a large bowl, whisk together the flour, baking powder and salt. In the bowl of an electric mixer, beat together the butter and sugar until light and fluffy. Beat the eggs in one at a time. Add the vanilla. Alternately add the flour mixture and milk to the butter mixture, begin and end with flour. Spoon (or scoop as in the video) the batter into the paper liners. Bake for about 20 minutes, or until the cakes spring back with touch in their centers. Let cool completely. Make the coffee soak: Combine all of the ingredients in a large bowl and stir until the sugar is dissolved. 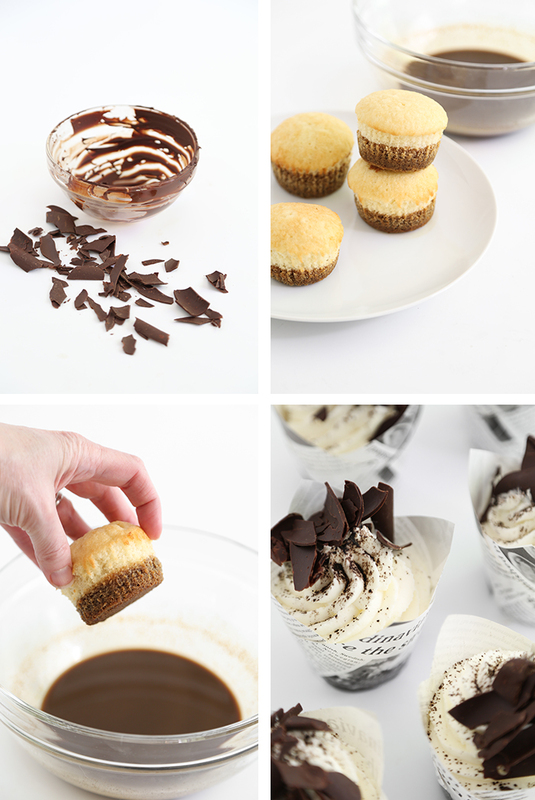 Remove the paper liners from the cupcakes and quickly dip the bottoms into the coffee soak. (The dip should take less than one second. If you over-soak the cupcakes they’ll fall apart.) Place the dipped cakes on a serving platter or in decorative cupcake papers. Make the frosting: Beat the heavy whipping cream in the bowl of an electric mixer until soft peaks form. Add the cornstarch and confectioners’ sugar. Beat until stiff peaks form. Add the cheese and vanilla extract. Beat until smooth and thick. Transfer the frosting to a large piping bag fitted with a large French pastry tip. Pipe the frosting onto the cooled cupcake in a swirling motion. 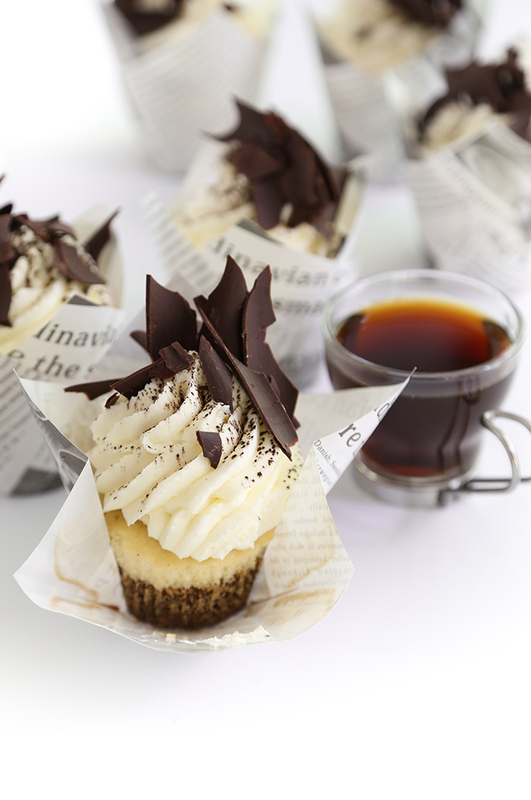 Garnish: Sprinkle each cupcake with cocoa powder and top with chocolate shards or shavings (see video for more info). Store the cakes loosely covered in plastic wrap in the refrigerator. These look amazing! I think 24 would be way to many for me-would it be easy to halve the recipe? Just not sure about the 3 eggs- how to measure 1/2? Thanks. Thanks for the awesome video! Where did you purchase the fun liners?? Hi! I purchase them in bulk, but you can find similar cupcake liners in smaller quantity at the following link. 50 ct. is probably a more reasonable quantity for home bakers. YESSSS. Tiramisu is one of my all-time favorite desserts and these cupcakes look both delicious and BEAUTIFUL!! These look gorgeous and a perfect way to end our dinner party this weekend!! These look incredible! So beautiful! Heather, as always these look amazing. Thanks for the video, too. Is there any chance that the cake will soak up too much liquid and become soggy? Can you recommend a yellow cake recipe since cake mixes are not readily available where I live? Thank you! I recommend using the scratch cake recipe at the bottom of this blog post. It is butter-based, which creates a firm cake. Cake mixes and other oil-based cakes are not recommended because they will be too soft and become soggy when dipped. The butter cake recipe will hold up well. I also mention in the recipe text to dip the cakes no longer than 1 second. This helps prevent a soggy bottom. I hope this helps! Good luck with the cakes! Heather, What will you think of next? These cupcakes are fabulous! As you mentioned, this would be great with a cup of morning Joe. 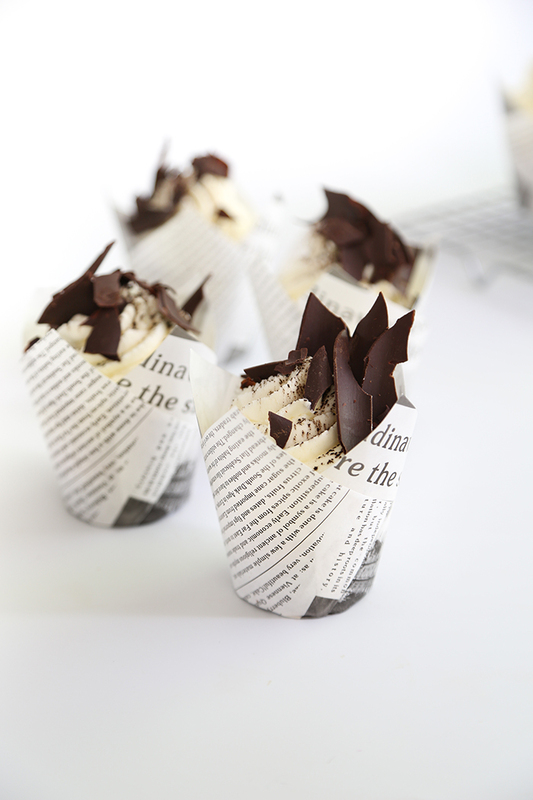 The newspaper cupcake liners are really cute and I enjoyed the video. The most beautiful interpretation of an Italian classic! What a great idea - they look fabulous! I've had a hankering for tiramisu recently, ever since the tiramisu brownie recipe I made didn't quite have the coffee flavor I was craving. Gonna make these cupcakes ASAP! Hi Heather! Amazing-cannot wait to try to make these and eat them too! I don't see your cake recipe? Also, I am ordering the liners (thanks for posting that info) but will they fit into a clear/plastic 12pk cupcake display box or are they too tall? thanks again!! The recipe is at the bottom of this blog post, just past the last paragraph. There's a 'click to print' in the top right hand corner. Do you see it? I hope the recipe is viewable. Perhaps try viewing the page with the Chrome browser? The cakes as I made them are a little bit tall, but you could probably dial back the height of the frosting. I'd say they should fit in a display box that way. Can't wait to try these,they look amazing! Hi, the cake recipe is at the end of this post. Please let me know if you're having trouble viewing it. The printable recipe is just below the last picture and paragraph in this blog post. They look amazing!!! Just with a quick question, is the espresso powder the same as espresso instant coffee? Thanks!! Hi! Yes! The product is called espresso powder or instant espresso. Regular freeze-dried coffee is not as strong, but if you can't find espresso powder then it will work in a pinch! 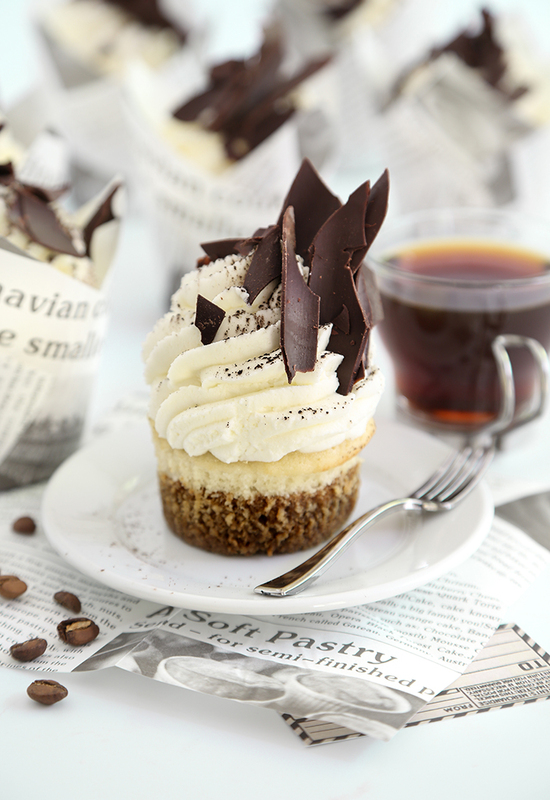 Hi Heather, I just love this Tiramisu Cupcake. But I would love the cake recipe but I can't view it below. Pls post it. Thank you!!! Hi Megan! Yes - Espresso powder refers to instant espresso that dissolves in water. Nescafe and Cafe Bustelo brands are both widely available, or you can find it at specialty baking shops online such as King Arthur Flour. Thanks for asking! Hi ! Just wondering if the Chocolate Shards are Dark Chocolate or Milk Chocolate in the Picture. Perfect ! Thanks ! Hi! I'm 90% sure I used dark chocolate. There's a small chance it could be semisweet baker's chocolate - I just can't remember. I feel like I used dark chocolate because I remember purchasing an 11 lb. bag in April. I absolutely love your blog, Heather! I've made these cupcakes at least three times, and every time they get wonderful reactions. There's a smile on my face every time I see another blog post notification. Thank you! Made these tonight for a friend, and they were so freaking tasty! I’m always a little skeptical of trying out new recipes without reviews and/or ratings, but took a chance with these. I’m so glad that I did, just the right balance of coffee and Kahlua flavor.